A new tutorial on data association methods. And other new titles in Computer Vision. This book serves as a tutorial on data association methods, intended for both students and experts in computer vision. It describes the basic research problems, reviews the current state of the art, and presents some recently developed approaches. The book covers multi-object tracking in two and three dimensions. It considers two imaging scenarios involving either single cameras or multiple cameras with overlapping fields of view, and requiring across-time and across-view data association methods. 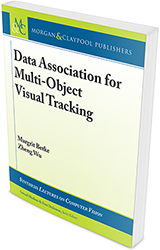 In addition to methods that match new measurements to already established tracks, Data Association for Multiple-Object Visual Tracking describe methods that match trajectory segments, also called “tracklets.” The book presents a principled application of data association to solve two interesting tasks: first, analyzing the movements of groups of free-flying animals and second, reconstructing the movements of groups of pedestrians. It concludes by discussing exciting directions for future research. ISBN: 9781627059558 | e-BOOK ISBN: 9781627059435 | 120 pages | JUST PUBLISHED! Prefer print or need access to an e-book anywhere? University or Corporate? You may have access!